If you are a new customer requesting a service appointment with us for the first time, please submit the following attachment completed to Service@GKTRefrigeration.com or fax it to us at 401-365-1699. You will also need to submit the Customer Contact Form. Are you looking to become a new customer at GKT Refrigeration? Are you an existing customer that wants to update your invoice preferences or contact information? Use this form! 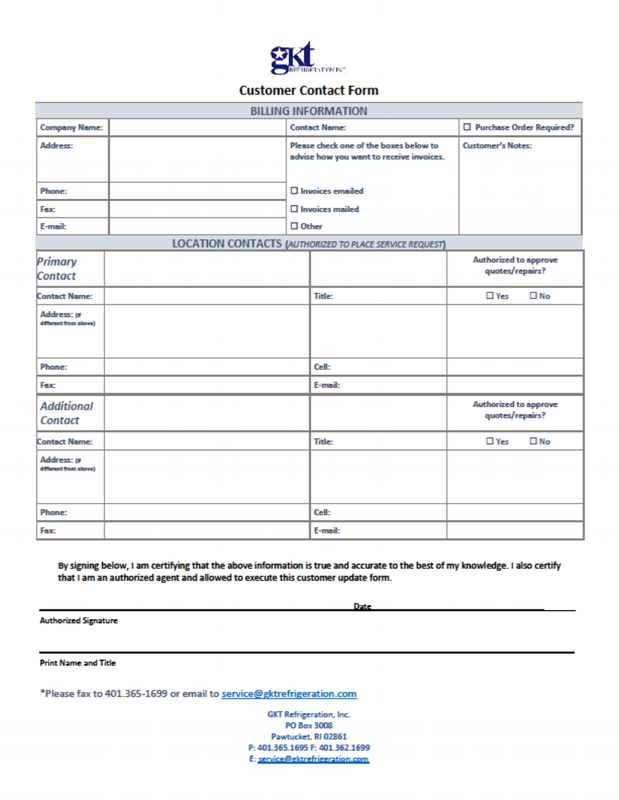 Fill out all the corresponding information and email it to Service@GKTRfrigeration.com or fax it to us at 401-365-1699 and we will update or create your customer profile. If you are a new customer please also fill out and provide us with the New Service Agreement form, or if it is for warranty service please also send the Warranty Service Agreement. If you have been directed to GKT Refrigeration by one of our partnered manufacturers to schedule warranty service, or you know your unit is under warranty, please fill out the Warranty Service Agreement and send the completed for to Service@GKTRefrigeration.com or via fax to 401-365-1699. The information on this form is confidential and will not be kept on file with us after your services are complete. Credit cards will not be charged after service, unless the service was not considered to be covered under warranty. GKT Refrigeration will never charge a card without cardholders knowledge, thus giving the option for alternative payment before utilizing the information provided on this form. You will also need to submit the Customer Contact Form if you are new to our services.